Sending out regular newsletters to people who have elected to signup through your site can be very beneficial to your business. By keeping in constant contact, you are reminding them that you are here and you just might have something new to tell them about. You may have multiple signup boxes throughout your site for different purposes - to see who is interested in what topic or maybe to send them to a free or paid download (see how to send automatic downloads here). So how do you send one newsletter to several different lists at one time. MailChimp can seem a little confusing at times and their help area is sometimes not as helpful as you’d like, especially when it comes to joining your lists. It took me a few times to get this right, so I wanted to share with you how to do this. You might be asking yourself, “why can’t I just send my newsletter to several different lists?”. You can, but then you’ll have two things to deal with. First, you would then have several different reports (campaigns) to review. Second, you run into the very likely possibility that you would send your newsletter to the same person more than once if someone had signed up for more than one free/paid download throughout your site. Groups are a way for you to segment your list into different categories. This can be done a couple of different ways. First, you can have this as an option in the area where someone signs up. If you already have people in your list but now you want to segment them into different groups, you can add them to groups. This will help you keep your list neat and organized. Let’s say you’re ready to send your newsletter. You currently have several lists that need combined into one large master list. First, backup your lists!! If anything goes wrong, you’ll have your backup to restore your list. To backup your list, download the .csv file (this is a type of Excel file). As you download each file, rename each file to the List Name and today’s date. Caution: If you download them all at once, you’ll get confused as to who belonged to what list. Now you should have each of your lists backed up on your computer. This will include each of your smaller lists and which ever list you consider your Master List. 1. 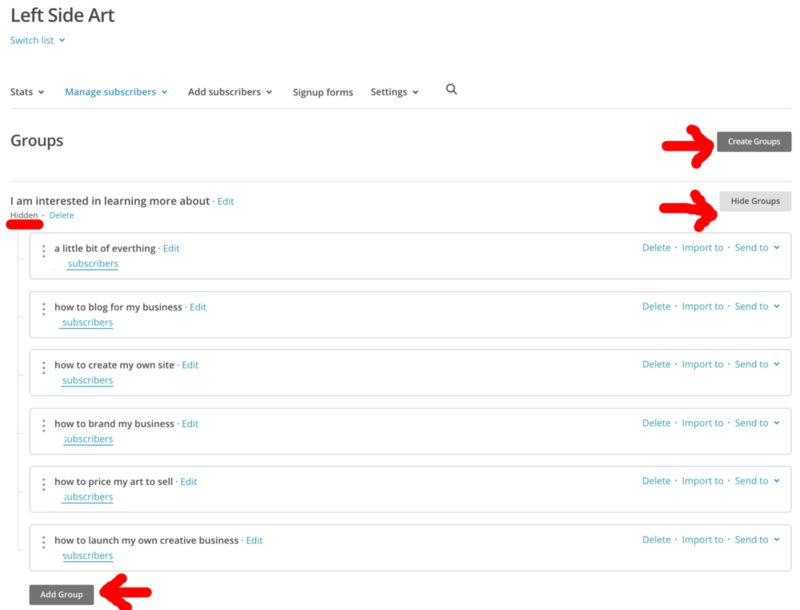 Go into your Master list in MailChimp, go to "manage subscribers" pull down menu, select “groups", go to "view groups” located at the right of your screen. 2. Add your groups here and select visible or not visible. 3. Alternatively, you can add groups in your signup forms under your Master list. You can make the groups hidden. If they are visible, people will see these groups when signing up and be able to select what is most interesting to them, which is also a choice for you. 4. Now it is time to add your smaller lists to your Master list. You could do this all in Excel (or Numbers), but let’s use MailChimps system. 5. Go back into your Master list in MailChimp, go to "manage subscriber" pull down menu, select “groups", go to "view groups” located at the right of your screen. 6. This time, click “import to” under the group that best represents your smaller list, and select your .csv files. 7. MailChimp will tell you which columns of data will not be carried over due to differences in your lists. These differences are based on what data you were collecting. For example, you may have required first and last names in one of your smaller lists, but required first names in your Master. The last names would not carry over. If last names is important for you to keep, then you will want to merge your data in Excel/Numbers and load to MailChimp as a new Master list. 8. After you select save or skip through each of the columns that MailChimp may or may not be carrying over, you will then be able to send a campaign (newsletter) to your entire Master list or a group(s) from your Master list. 9. The next time you do a merger like this, MailChimp will remember which columns of information you wanted to keep and you can bypass the “save” or “skip” options by selecting to use the settings you used the previous time - a box will show up with this option. 1. Go into one of your smaller lists and select “combine lists” from the drop down menu located next to Stats. 2. Move people into your Master list group that best matches the smaller list. Note: The list you selected in Step 1 is the list you are taking people out of. The list you selected in Step 2 is where the people from Step 1 will be moved to. Try to be proactive and set up hidden groups within your lists and require the same fields for each of your lists. This will help you streamline your process. And most importantly, remember to back your lists up before trying to merge! Learn how to send your free or paid downloads automatically here.